After installing the new Ubuntu 15.04 Vivid Vervet, one of the top things to do is to install audio/video codecs and enable DVD playback. Due to legal constraints in many countries, Ubuntu does not include these codecs to play mp3, movies, and DVDs out-of-the-box. But we can easily get them from the default repositories through Ubuntu Software Center. Open Ubuntu Software Center, search for and install ubuntu-restricted-extras package. After that, you should be able to play your musics and movies through the default multi-players. 2 The previous step also installs libdvdread4, library to read DVDs. If not, install it from Ubuntu Software Center. Due to legal constraints in many countries, Ubuntu does not include multimedia codecs to play mp3, movies, and DVDs out-of-the-box. This quick tutorial will show you how to manually install the multimedia codecs to enable playback audio, video, DVDs in Ubuntu 14.10 Utopic. 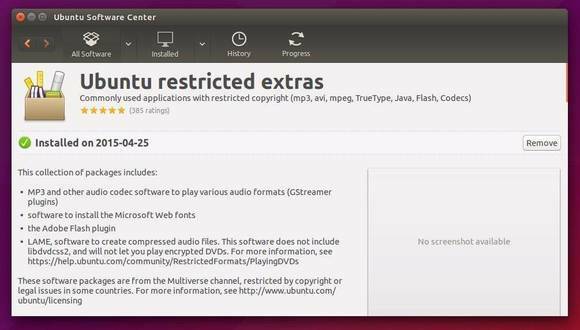 There is a package “Ubuntu restricted extras” available in Ubuntu Software Center. Installing it will pull in support for MP3 playback and decoding, support for various other audio & video formats such as mp4, avi, rmvb, wmv and more, Microsoft fonts, Flash plugin, LAME (to create compressed audio files), and DVD playback. During the installing process, you will be asked to accept the EULA license terms. Tip: If you get a warning dialog says “to install ubuntu restricted extras, these items must be removed”, just click the ignore because -extra versions of these libraries will be installed instead, to provide additional functionality. After installed the package above, you should be able to play normal DVDs. But for playing encrypted DVDs, libdvdread4 and libdvdcss2 are also required. When done, you should be able to playback (and navigate DVD menus) in most video applications, including the default Totem and VLC media player..
Want to play DVDs on your Ubuntu Desktop? Well, Ubuntu can’t play DVDs out of the box for a whole tangle of legal reasons. But you can follow this tutorial to enable DVD playback in Ubuntu 14.04 Trusty Tahr. Fluendo DVD Player is a software application specially designed to reproduce DVD on Linux/Unix platforms, which provides end users with high quality standards. Don’t want to pay? Thanks to the open-source software libdvdread, it provides the library to read DVDs in Ubuntu Linux. To install it, open Ubuntu Software Center and search for and install the package libdvdread4 and libdvdnav4. This script will allow you to play encrypted DVDs in Ubuntu. Once installed, you’ll be able to playback and navigate DVD menus in most video applications, including the default Totem and VLC. This simple tutorial shows you how to enable DVD playback and install multimedia codecs in Ubuntu 13.10 Saucy, so that you can play encrypted DVDs, wmv, mpeg, mp3, divx, and more with the default player. All you need to to is run below commands in terminal one by one and then restart your computer to take effect. This brief tutorial will show you how to install DVD decryption library to enable DVD playback on Ubuntu 13.10 Saucy, 13.04 Raring. Due to legal reasons, Ubuntu doesn’t play normal or encrypted DVDs by default. For easy, you can install Fluendo DVD player which is specially designed to reproduce DVD on Linux. It costs $24.95. For free, you can enable this feature by installing the libdvdcss2 package which is available in medibuntu repository. But the maintainer will stop maintaining the Medibuntu repository, the repository will stay on line as is for a while. Legal Warning: Check with your local laws to make sure usage of libdvdcss2 would be legal in your area. After reboot, VLC media player should play DVD movies.